After 5 months of having these blocks up on my design wall, I finally pieced them all together. 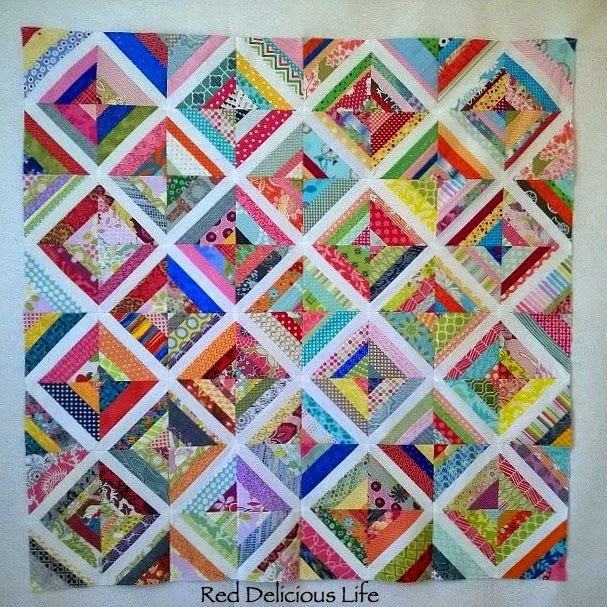 These are the blocks I received from my Compass Quilter bee-mates. I'll admit, it wasn't out of any burning desire to finish this WIP. To be honest, it was because I needed my design wall back for a new project that I just started earlier this week. So now I just need to decide whether or not to add any borders or keep it like it is. Staying motivated enough to get it quilted and bound would also be a plus but I'm going to be realistic for a change. I hate when I'm not feeling the love for a particular project. I think it happens to everyone from time to time. I thing these string blocks are just so cheerful though, Diana! I think they look great without a border, but either way would be pretty. I love this project! I think it will be fun to machine quilt with a straight stitch. I think it turned out great, it was a fun block to make. I love all the fabrics, such a great way to do a scrappy quilt. I'd keep as is. I really like the scrappyiness of it all!